Should dogs be crate trained? Dogs are den animals, and providing a crate for a dog goes along with his natural instinct to have a space of his own (his den) to nap, have quiet time, or hide from thunderstorms. It's nice for a dog to have a space that's all his own, to feel safe and secure, and find comfort and solitude. It also happens to be a great place for him to be instead of destroying your house while you're gone or peeing all over the place! The most common use for crate training is for potty training puppies. Dogs instinctively don't like to soil their dens. That's why crating puppies help in housebreaking - they're likely not to pee or poop until they're out of the crate. This puts you in control of where and when your puppy relieves himself. The use of a crate also limits a puppy's access to the entire house until he learns the rules, like not chewing on furniture. Crates are also a safe way to transport your dog in the car, and can be helpful when you need the dog to be under control when company comes over, or when you're having something done at the house like plumbing or repair work. Training a puppy to sleep in a crate also provides for a good night's sleep for the puppy - and the whole family! Crates come in different sizes and styles. Here are a few samples of what types of crates are available. Plastic (often called "flight kennels"). You can see a selection of these HERE. Most commonly used style. You can see a selection of these HERE. F abric on a collapsible, rigid frame. You can see a selection of these HERE. Collapsible, metal pens. You can see a selection of these HERE. Fancy-Schmancy looks-like-furniture crates. You can purchase these HERE. The dog's crate should be just big enough for him to stand up and turn around in. 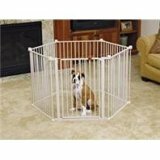 If your dog is still growing, you may wish to get a crate large enough to accommodate his adult size, but block off the excess crate space until he gets bigger. Too much space in the crate may result in his being comfortable relieving himself in one end of the crate. You should do crate training in small steps - not fast! Step 1: Introducing Your Dog to the Crate. 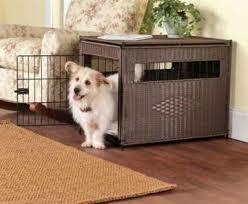 Put the crate in an area of the home where the family spends time, such as the living room or family room. Dogs don't enjoy being isolated - they want to be with the family/pack! Put a soft blanket at the bottom of the crate and keep the crate door open. Allow the dog to explore the crate as he wishes. Some dogs will be curious and enter the crate right away - others will be more apprehensive. Using a cheerful tone of voice, invite the dog over to the crate. Make sure the door is wide open so it won't hit him and startle him as he pokes his head inside. Encourage the dog to go into the crate by putting small food treats just inside the crate...then a few deeper in. Don't force the dog to go inside. Let him take his time. Keep tossing treats inside the crate until your dog is calmly walking all the way inside the crate to get the food. This step could take two minutes - or several days. It is crucial for you to be patient and not force it. Step 2: Give Your Dog All of His Meals In the Crate. This will create a positive, pleasantassociation with the crate. If your dog is comfortable entering the crate, place the food dish all the way to the back of the crate. If your dog is reluctant to enter the crate, then put the dish just inside the crate at first - moving it a tad further toward the back of the crate at each feeding. Once your dog is comfortable eating all of his meals inside the crate, you can start closing the door while he's eating. The first time you do this, open the door as soon as he's done eating. Then with each meal thereafter, leave the door closed just a few minutes longer...and longer...and longer...until he's staying in the crate for about ten minutes after eating. If he starts to whine, you may have increased the time too quickly. Leave him in the crate a shorter time next feeding. Then increase the time more slowly. Don't let him out of the crate when he's whining. Otherwise, he'll think that's the way to get out and he'll keep doing it. If you have to, slip him a treat...wait for him to be munching quietly...then open the door. Step 3: Start Leaving Him in the Crate for Short Periods of Time. Once he's eating all of his meals inside the crate with no anxiety, whining, or fear, you can start to leave him inside the crate for short periods of time. Call him over to the crate and give him a treat. Then point to the inside of the crate and encourage him to enter with a treat. Give him praise once he's inside, give another treat, and close the door. Sit quietly near the crate for a few minutes (5 or 10). Then go into another room for a few minutes. Come back, sit quietly again for a short time, then let him out of the crate. Repeat this process several times a day if possible, increasing the length of time you're leaving him in the crate while you're out of his sight. Step 4. Start Crating Your Dog When You Leave. Once he'll stay in the crate for about 30 minutes with you out of site, and without becoming afraid or anxious, then it's safe to start leaving him in the crate when you're gone from the house for short periods of time, or letting him sleep in the crate at night. Start slowly with this. It can take several days or several weeks. Just keep practicing! Don't make your leaving a big, emotional thing. Just act casual - like "business as usual." Give him a little praise, give him a treat for entering the crate. Leave a crate-safe toy inside the crate with him, then quietly leave. When you get home, don't act excited and don't reward his excited behavior. Again, act casual. This will avoid increasing his anxiety. Remember during this time to continue to crate your dog while you're at home so he doesn't just associate the crate with your leaving. Step 5. Crating Your Dog at Night. Use the same procedures you're using when you leave. Direct your dog to the crate using the regular command, and reward him with a treat once he's inside. If you're crating a young puppy, you may want to place the crate near your room because he'll have to be let outside sometime during the night until he gets older. Older dogs should also be allowed to sleep near family members. Remember, dogs don't enjoy isolation. Older dogs have habits they've been forming their entire lives. Puppies don't know any different, whereas adult dogs may take longer getting used to the idea of a crate. Be kind and patient, and do your best to create positive associations around the crate. Lots of praise and treats! Make sure the crate is comfortable. Especially for an elderly or injured dog, make sure the crate has a soft blanket, a pillow or cushion, and one or more of the dog's favorite toys. What if the Dog Whines in the Crate? Here's a cute video where professional dog trainer, Doggy Dan, owner of the dog training website, The Online Dog Trainer, shows us how to deal with little Moses in his crate. Don't reward your dog's whining by letting him out of the crate. As long as he's been fed, he's not thirsty, and he's been allowed to go outside to relieve himself, then he's probably just whining to be let out of the crate. If you think he needs any of those things, attend to it immediately. But if all that's covered, then try to ignore the whining. He's testing you...he'll probably stop whining soon. Pounding on the crate or yelling at him will only make things worse. If you've followed the training steps outlined above and haven't gone too fast, then you'll be less likely to have this problem. But if it becomes unmanageable - if the whining won't stop - then you'll likely have to take a few steps back with the crate training. Start putting him in for shorter periods of time, lengthening the time gradually, etc. Let's talk about the DON'Ts! Do not see the crate as a babysitter or a magical solution. If you're not using the crate correctly, your dog can feel trapped, upset, frustrated, and can even panic to a dangerous degree. Do not use the crate as punishment. If you do, your dog will begin to fear the crate and refuse to enter it. The crate is supposed to be his SAFE place, not a place for punishment. Do not leave the dog in the crate too long. Crating your dog all day and night is just cruel. Dogs need as much human interaction and exercise as humans do, and just like humans, will become depressed and anxious if locked up in a cage all day. If you have to be gone from the house for long periods of time, you need to make arrangements for someone to come and let your dog out of his crate, let him outside, and give him some attention. You have to be reasonable with the amount of time you expect the dog to stay in a crate. Puppies can't hold their bladders as long! Puppies under six months of age should not stay in a crate for more than three or four hours at a time. They simply can't hold their bladders or bowels that long. Use similar logic when crating an adult dog. Consider how long your own bladder would hold! Avoid making crate training a traumatic experience for your puppy. You need to make sure he feels comfortable throughout the process. Never leave a puppy locked up and left alone if it's his first time inside the crate. 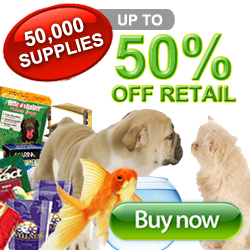 This can be extremely traumatic for the puppy and will make it difficult (impossible!) to get him to go inside the crate from then on. Don't crate your dog if it's not necessary. In other words, once your dog is house trained, and if he doesn't destroy the house while you're gone, then he doesn't necessarily have to be locked in his crate while you're gone. Keep his crate - for his use and comfort. But you can give him free run of the house once his behavior is appropriate. Don't try using a crate to deal with separation anxiety. This will not solve the problem. It may be prevent your dog from being destructive, but he could injure himself trying to escape from the crate or panic to a dangerous extent. If your dog is suffering from separation anxiety, I suggest you read this article, Treating Dog Separation Anxiety. If you're patient, consistent, and use lots of practice, your dog can learn that his crate is a safe, enjoyable place, not a prison. If you do crate training correctly, your dog's crate will become his favorite place to relax!